I’ve been in Santiago for a week now, and it might just be my new favorite place. The fall weather is fantastic, at about 75 degrees daily, the food is amazing, and the people are even better. I’m staying with my “sister” and her family, an exchange student that I hosted two years ago. While I haven’t seen much of Santiago yet, except for the Costanera center, (I mean how could you miss it? It’s the tallest building in South America!) I have been experiencing its culture. I went with my host mom to school last week and got to chat with students, and I’ve gone to several parties with my sister. 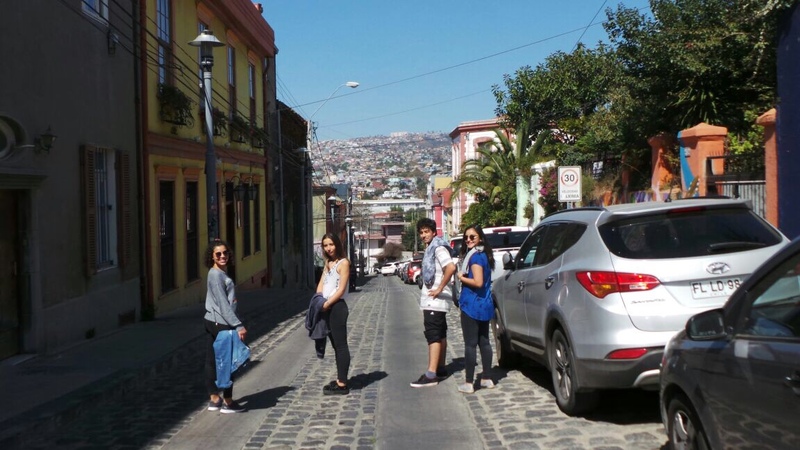 On Saturday, we took a family trip to Valparaíso, a city on the coast and the most important port of Chile, according to my host mom. We walked along the harbor, until we came upon a churro stand, where I got a taste of my very first churro ever (yes, churros are from Mexico, but Chileans love them). I don’t think anyone needs me to tell them this, but it’s delicious. We then hiked up some stairs to see the beautiful vista overlooking Valparaíso and the neighboring city of Viña del Mar. I’m pretty sure I’ve described nearly every view as straight out of a magazine, and it’s true. If you squint, you can see the little ships dotting the harbor, while all around you are hills upon hills of colorful homes. Walking around the hills of Valpo, AKA the historic quarter, is stunning. It’s filled with restaurants, cute artsy boutique stores, and impressive street art. There are also little spiders painted all over the sidewalks, which I had an urge to follow. Another day. We sussed out a few restaurants before deciding on something distinctly Chilean. I got tuna, after all we are on the coast, and it was muy sabroso! I also had the best lemonade in my life, complete with ginger, basil, and orange. After lunch, we got some gelato, and I had my first taste of chai gelato, a true delight (lots of firsts in the food realm today!). To get back down the hill, we took an antique elevator. Then we drove over to Viña del Mar, hopping out of the car on the way to snap a pic by the giant clock of flowers. We walked along the coast, stopping to peek at all the little jewelry vendors along the way. We came along a huge crowd on the street, and joined them in watching a mime (mimo!). His stunts included standing in the middle of the road until a car nearly hit him, then finding some way to piss off the driver even more. It was genuinely funny entertainment, and quite a few of the drivers actually got into it and joined in the act. Once he clang onto the front of a bus, and rode it Titanic style. Another time he hopped into a moving horse carriage, sufficiently startling its occupants. We also took a stroll on the beach, and got to be there for the sunset before heading home to prepare for Easter Sunday, or Pascua. Time to finish eating my chocolate eggs! Make sure to follow below to receive notifications of new posts to come along with me on my journey! Next What to See and Do in Santiago, Chile!